For starters, let's stop calling Baltimore's angry young black men "thugs." I don't condone the actions of rioters or looters. It's terrible that police officers were hurt and businesses were destroyed or damaged. Having worked as an educator with inner-city youth for over thirty years, however, I can attest that teenagers raised in poverty are chronically anxious, frustrated, afraid and mad--but the majority are not "thugs." 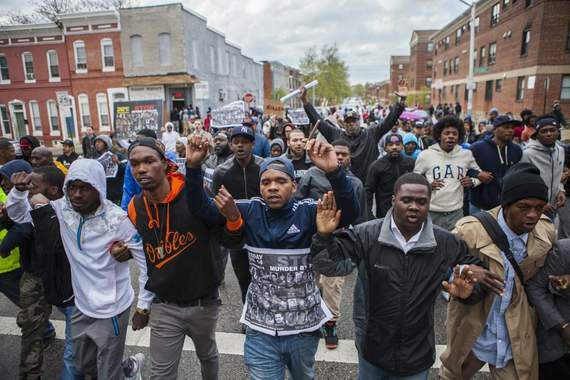 Out of 23,000 Baltimore City public high school students, roughly 200 may have engaged in rioting or looting (235 people were arrested during the riot; police said on Twitter that many were "juveniles"). "Of course it's not the right word, to call our children 'thugs,'" Baltimore City Councilman Carl Stokes told CNN's Erin Burnett last Tuesday. "These are children who have been set aside, marginalized, who have not been engaged by us." In the wealthiest state in our nation, Catholic Charities of Maryland found in 2014 that 36.5 percent of Baltimore City children live under the poverty line. Add a police department that practices "zero tolerance" policing and is notorious for administering beatings and "rough rides," and you have a powder keg ready to explode. Freddie Gay's horrible death and the police department's tone-deaf response lit the match. I congratulate Baltimore City's State's Attorney Marilyn J. Mosby for pressing charges on May 1 against all six officers involved. 1. End "zero tolerance" policing. 2. Expunge juvenile records for youth saddled with nonviolent convictions by zero tolerance policing. 3. Teach every public high school student how to participate in our economy by providing financial literacy and entrepreneurship education classes. Zero tolerance policing clamps down on minor crimes like graffiti to deter more serious criminal activity. It was instituted in Baltimore by former mayor Martin O'Malley, who served from 1997-2007. Speaking to CNN April 30, former police commissioner Edward Norris (2000-2002), explained that zero tolerance resulted in people being arrested for "drinking a beer in front of their homes," and said, "zero tolerance is a bad policy, it will never work in any city. When people misunderstand it and twist it and pervert it, you end up with this kind of problem." At least, Norris added, Freddie Gray's tragic death "opens a dialogue into how we got into this mess." The Baltimore Sun uncovered that the city has paid $5.7 million since 2011 to settle lawsuits brought by residents for 102 instances of "excessive force." The city spent another $5.8 million on legal fees defending police officers. The New York Times ("Baltimore's 'Broken Relationship" with Police") reported April 24 that Mr. Gray is not the first black man in Baltimore to emerge from a police van with a spinal cord injury. Jeffrey Alston, who became paralyzed from the neck down after a van ride, settled for $6 million in 2004. The following year, Dondi Johnson, also paralyzed after a van ride, won a jury award of $7.4 million. Alarmed by the number of wrongful death lawsuits against Baltimore's police department, Mayor Stephanie Rawlings-Blake requested a Justice Department review last year. Let's hope she can end "zero tolerance," which she has repeatedly criticized as a crime-fighting strategy. The staggering arrest rates caused by zero tolerance have saddled many of Baltimore's young minorities with criminal records. A juvenile criminal record can follow you for the rest of your life, making it difficult to find a job, rent an apartment, obtain a mortgage or join the military. Baltimore should seriously consider expunging juvenile criminal records for non-violent offenders caught in the zero-tolerance net. ExpungeMaryland launched July 2014, after its founders noticed that more people in Baltimore and Maryland search for expungement on Google than from any other city or state. ExpungeMaryland provides an app and online assistance. It also seeks to draw attention to what founder Jason Tanesha says are "needlessly complicated laws on expungement in Maryland compared to other states." One thing does engage inner-city youth who feel marginalized--teaching them how to participate in our economy. I first started teaching impromptu business lessons at Boys & Girls High School in Bed-Stuy, Brooklyn in 1982 in a desperate attempt to gain control of my incredibly rowdy classes. To my shock, it worked! I started the Network for Teaching Entrepreneurship (NFTE) in 1987, because I consistently found that entrepreneurship education gets even the most disengaged students excited about learning. It helps them earn money, and relieves them of a great deal of frustration and hopelessness. Currently, though, our schools do not teach our inner-city youth financial literacy, and their parents may not know how to teach them either. Since opening in 2002, NFTE Baltimore, led by Patricia Eisner, has reached nearly 10,000 students from low-income communities with entrepreneurship education programs, including in some schools, such as The Reginald F. Lewis High School. Baltimore's Reginald Lewis was a brilliant entrepreneur from a middle-class family who became the richest black man in America in the 1980s, with a net worth of $400 million. He was a great supporter of NFTE, as is his widow, Loida Lewis. Mr. Lewis told me--and after spending my life teaching kids whom society has written off I am convinced--that there is no entrepreneurial gene that only a favored few have. Students exposed to entrepreneurship become aware of five assets every individual has: time, talent, attitude, energy, and unique knowledge of their communities. We have extraordinary success stories at NFTE, and I've personally witnessed many urban youth use entrepreneurship education to find pathways out of poverty. But first, we have to stop calling them thugs.